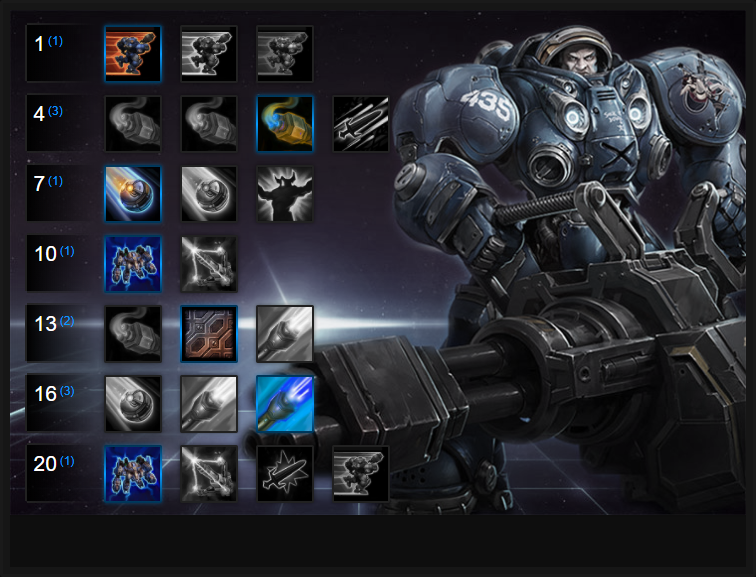 In this Tychus Build Guide, we provide an overview of his strengths, abilities, talents and matchups. Tychus is a ranged assassin. He utilises a minigun as well as grenades to deal AOE damage to opponents. His minigun allows him to rapidly deal damage, while his Overkill offers the ability to run and gun.. As he's an assassin, he can die easily if focused and he has a relatively low health pool; you'll need to kite well and position yourself on the edges of a fight to survive. Unlike Valla or Raynor, Tychus is all about continuous pressure and being able to disrupt the enemy. Both his Heroic abilities are very strong, with Commandeer Odin providing heavy AOE fire and burst damage while Drakken Laser offers single target pressure. In the current meta Tychus remains sought after simply because of his Trait, which allows him to deal bonus damage against a target based on their maximum health. Fighting against double-tank compositions makes Tychus a must-have pick, and even if he isn't against two Warriors, his mobility and sustained damage make him a valuable pick. Minigun (Trait) – Minigun provides a straight damage boost to your basic attacks, increasing each round from your minigun by 2.5% of an enemy Heroes maximum health. Due to rarely just being able to stand in place attacking an enemy, don’t count on this Trait for your damage output alone. However, key to using Minigun is being in the right position at the right time, so that you can stand still, firing away. It's best used on high health targets such as Warriors once they've dived into your team. With the rate of fire from your minigun being so high, the damage bonus soon adds up. Overkill (Q) – This is what you count on for damage output when you need mobility. Not only will Overkill deal high amounts of damage if kept on the same enemy, you can re-target it if your original foe moves out of range. On top of that, you’re free to move and use other abilities while it’s channeling. Keep in mind that like any other channel, you can be interrupted if you’re not careful. Also notable is that the cooldown starts as soon as Overkill is activated, so if you get the full 4 second duration, it’s actually a 8 second CD instead of 12. Frag Grenade (W)– An ability with several uses, Frag Grenade gives you the crowd control you need to ensure your positioning stays strong. You can throw it behind an enemy to knock them towards your team, or in front of them to make sure they can’t get to you. Just keep in mind the travel time increases the further away you throw the grenade, and you’ll sometimes want to hold on to it to interrupt important channeled abilities. It's particularly effective against E.T.C to prevent a Mosh Pit. Be aware that by default, its range isn't long and while great at finishing off a low health enemy, do try to save it to protect you or an ally. Run and Gun (E) – If you’re looking to secure a kill and you know an enemy is alone, feel free to dash in. However, most of the time you’ll be using Run and Gun more defensively, just looking to re-position yourself in team fights, or get back out once you’ve gone a bit too far forward looking to get down that Overkill damage. Just be aware that Run and Gun has a relatively long cooldown - don't waste it by chasing a Hero you want to kill, before leaving yourself vulnerable. Commandeer Odin (R) – There’s no mistaking when Tychus has called down Odin, due to a lengthy start-up animation. Because of this, be careful about when you activate your Heroic, making sure that the team fight will continue, and will still be in range of you, once you’re ready. That said, Odin can be a huge game changer. The basic attacks are extremely strong, and the abilities he can lay down are a pain as well. Keep in mind that Odin’s abilities share separate cooldown from Tychus’ abilities, so use that to your advantage. Drakken Laser Drill (R) – When utilized properly, the drill can deal significant amounts of damage. However, it does require some team coordination to play around, as enemies can easily kite away from it and fight outside its range if your team doesn’t keep them in place. In coordinated team play, the drill may be the way to go. However, Odin offers more flexibility, and is usually the correct choice. Tychus, outside of Overkill, isn't mobile, but needs to maintain his attacks on high value targets. Press the Advantage allows him to increase the range of his basic attacks by 1.5 for 3 seconds after using Run and Gun, allowing him to engage or retreat while still being able to deal damage. It's key to his playstyle of dealing damage to high value targets. To end fights early and eat chunks out single or multiple targets, The Bigger They Are is fantastic. Boosting the damage modifier of Tychus' Trait from 2.5% to 4%, it allows him to rip through targets with ease. The only downside to this is the fact when a target is below 35% health, your Trait will do nothing. Either way, it's a good trade-off if you're wanting to start and end a fight early. Variant: Tychus relies massively on his Trait and it's the primary reason why he's such a threat to double Warrior compositions or high health Heroes. In the Rythm allows you to elongate Miniguns duration by 0.3 seconds for every basic attack you land on an enemy, while Minigun is active. It doesn't sound a lot, but it's possible to gain well inexcess of 10 seconds additional duration (on top of the 3 you already start with). Unsurprisingly, if you can increase the stacks to such levels, your damage over time and the sustain on your trait goes through the roof. This variant is best if you anticipate lengthy sustain fights. Quarterback allows Tychus to throw his grenade from 50% further away. For chasing enemies down, poking from afar or for a skilled knockback, it's invaluable. Great on Battlegrounds such as Cursed Hollow or Towers of Doom that require objective interaction. Variable: Against a stun or root heavy composition, such as Diablo and Stitches, take Relentless Soldier. The 25% armor it provides will save your life countless times over. If you're after pure damage, or zoning pressure/potential, Commandeer Odin is an excellent choice. Not only do your basic attacks hit from 100% further away, but you also gain an additional set of abilities that displaces enemies and applies lots of AOE pressure. Without Stoneskin Tychus is very squishy. Taking Neosteel Coating allows him to mitigate a large amount of incoming ability damage, providing some much needed relief from high damage Heroes such as Kael'thas and Li Ming. Variable: That's The Stuff allows your trait to heal for 100% of the bonus damage. It might now sound a lot, but based on the duration of your Minigun, combined with the maximum health modifier, ensures a solid stream of rapid health gain after it expires. By default, Overkill doesn't do amazing damage. What it does do however, is allow Tychus to follow an enemy with steady damage. Armor Piercing Rounds changes this and boosts Overkill's damage by 50% to the main target, allowing Tychus to be a serious threat while on the move. Extending the duration of Odin by 50% while also allowing Ragnarok Missiles to launch a Nuclear Missile, Big Red Button allows Tychus to pressure for longer, while dealing massive damage. Tychus is capable of taking on most Heroes 1 on 1 thanks to his grenade knockback and his minigun pressure. That said, if he extends too far he'll die easily and against Heroes that can root or slow, he'll struggle to come out on top. Below is a list of Heroes that are the biggest threats to Tychus and how you should deal with them. Illidan: Illidan is incredibly strong against Tychus because of his ability to mitigate your damage and dive to you. Although you can kite him with Overkill and Frag Grenade, if either of these are on cooldown you'll take a beating. Jaina: Her ranged poke, slows and powerful Heroic abilities can be a real headache for Tychus. It's hard to stay in range to fight her without taking huge amounts of damage. Kael'thas: If he's in range and catches you in Gravity Lapse it can all be over very quickly. Poke him from afar, pressure with Frag Grenade and use minions in lanes as body blocks. Kerrigan: With her leap and pull, Kerrigan is very strong. Your Overkill is your best form of defence and if she gets too close, drop a Frag Grenade at your feet before using Run and Gun. Nova: Nova can pretty much one-shot Tychus during mid to late game. There's little you can do about it besides permanently keeping an eye out for her shimmer when cloaked. If you do see it, drop a grenade there and you should be able to at least run away. Stitches: His hook is a real threat because your Run and Gun has such a short escape. You'll likely be snared again and die. Try to stay back and use minions to block the hook. The Butcher: His self healing, slow and Lamb to the Slaughter can cause you huge problems. The fact his Onslaught also makes him unstoppable prevents your grenade being of any use. Thrall: If he successfully lands his root, at the bare minimum you'll take a huge chunk of damage. You'll be able to kite him with Overkill but his poke from Chain Lightning make this a tough matchup. Valla: Her range, slow and elite stun make her a powerful enemy. The best you can hope for is to survive out her mana pool at which point you should zip into combat with Run and Gun and Frag Grenade. She has the edge most of the time. Zeratul: Similarly to Nova, Zeratul can mess you up very quickly. Watch for his cloak shimmer, drop your grenade and use Overkill to kite him. This list of tips and tricks are just a handful of things we think will help your Tychus play. We'll continue to add to the list as required and if you have any tips you'd like to share, let us know in the comments below and we'll place them here. 1. Positioning is incredibly important with Tychus. Too far out and you simply can't survive if rushed. 2. Remember that with this build, your Frag Grenade does huge damage to high health Heroes. Make the most of it with Overkill on top. 3. Always use Frag Grenade against an enemy Hero that can stun your team. ETC and his Heroic is a perfect example. 4. Your Overkill allows you to continue firing while moving. You'll also be able to deal splash damage to anyone near your main target. Make the most of this kiting skill. 5. If you're going into a team fight and have your Heroic ability ready, make sure you use it a little bit early to take account for the build time. 6. Your Heoric ability, Odin, deals massive basic attack damage. Use this when you've consumed your abilities. 7. Tychus is an ideal Hero against teams with two or more Warriors. His Minigun Trait and Frag Grenade allow him to deal huge damage to them. 8. Try to always position yourself in a team fight so that you can use Minigun and then freely deal damage, without moving. Tychus' damage stems from his ability to pump out damage rapidly. but that can only be achieved if he stands still for lengthy periods. 9. Tychus often works best with a double-Warrior composition on his team so he has a protective front-line. 10. Be sure to use Run and Gun to follow a low health Hero, but don't chase if there's a risk of death to yourself. 11. Your talent at level 13 that provides healing when Minigun is active only works against Heroes, but once you've wound up, it'll keep you alive against most enemies (except Butcher and Varian).